You can make homemade candles without using wax. This type of candle can burn as long or longer than some wax candles. Most of the supplies you'll already have on hand, or they can be purchased at your local grocery store. 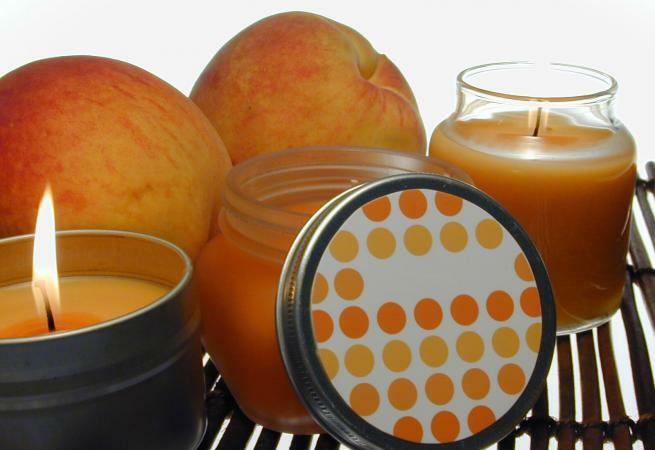 This popular DIY candle is inexpensive and easy to make. It doesn't require special candle making supplies or tools other than candle wicks. Melt the shortening. If using a saucepan, cook over medium to low heat and continuously stir until the shortening is melted. If using the microwave, place shortening in a bowl and heat in 30-second intervals until thoroughly melted. Don't allow the shortening to boil. Use tacky glue or a glue gun to secure the weighted end of the wick to the inside bottom of the candle holder. Place in the center if using one large wick and don't place too close together if using two or three wicks. If necessary, you can twist two smaller wicks together for a thicker wick. If the wick won't stand erect, use a skewer or pencil to wrap the wick around to keep it straight while pouring the melted shortening into the holder. Use an eye dropper to add liquid candle dye of choice to the melted shortening. Add one drop at a time and stir until blended. Add more drops until you achieve the desired color. If you want a scented candle, add the essential oil(s) to the shortening. Start with two or three drops and stir until blended, adding more until you reach the desired scent strength. Slowly pour the melted shortening into the glass holder. The shortening will begin to solidify as soon as you remove it from the heat, so you'll want to be timely. Be careful not to burn yourself. Once the shortening fills the candle holder, allow it to sit undisturbed until it solidifies. Depending on the candle size, this could be a few minutes or it might require several hours. Cut the candle wick about a half-inch above the candle. If the wick is too long, it'll self-extinguish. There are a few things you can do to make your shortening candle more creative or easier to create. You may prefer to transfer the melted shortening into a large glass measuring cup with a spout for better pouring. Make a multi-colored candle by working in layers. Melt smaller amounts of shortening and use different liquid candle dyes. Add colored layers until the candle holder is full. Hot glue seashells and glass beads to the inside and color the shortening in varying degrees of blue for a coastal candle. The water and oil candle is the easiest non-wax candle you can make. It doesn't require a lot of supplies or tools. Fill the candle holder about three-quarters full with water. Add food coloring and mix using the spoon. Slowly pour the lamp oil in a fine stream on top of the water. Cut a piece of plastic, like from a disposable food container or a plastic cup lid, so that it is smaller than the candle holder circumference. Cut an X in the center of the plastic. If using a cup lid, you can use the existing straw hole. Insert the wick through the opening in the plastic. Lower the plastic lid into the oil, careful to keep the wick erect. The plastic lid will sink into the oil and float above the water. Trim the wick if necessary so it is about a half-inch above the lamp oil. Light the wick with a candle lighter or match. The candle will burn until the oil is burned up. You can transform an orange or grapefruit into a candle. Oranges are a very popular choice for a medium-sized candle. Go around the rim of the fruit using a spoon to remove all the pulp. Leave the inner center stem intact and attached to the peel. Carefully pour lamp oil into the emptied orange half. Be sure to leave a top portion of the stem above the oil. Optionally add any essential oil you want to the lamp oil. Light the orange stem. It will burn as long as there's oil. It's easy to make candles at home without wax. Embellish the candles with homemade labels to make them extra special, adding a personal decorative touch to any room in your home. They can make excellent gifts too!